Hiawatha Flats II is a 70 unit apartment building located in the quiet Longfellow neighborhood, and across the parking lot from Hiawatha Flats. It is just two blocks from the Metro Transit Hiawatha Line’s 46th Street Station and just minutes from downtown via light rail. 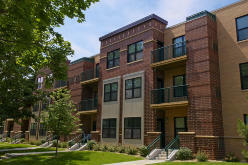 Each apartment has generous closets, a private balcony, washer and dryer, stainless steel appliances, and more. Some units feature private entrances to the apartment home.